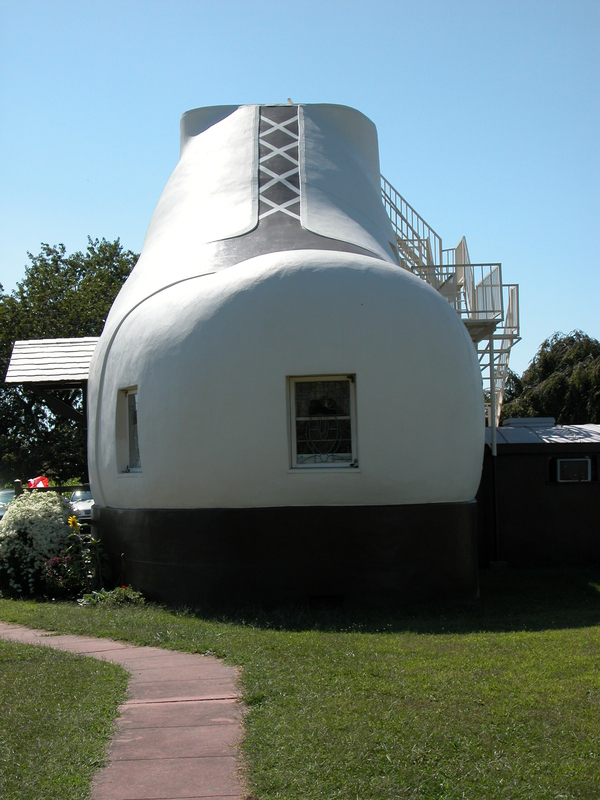 The world of architecture is full of strange, weird, cool and wonderful buildings. Some are old, some are incredibly old and some are ultra modern. Architecture, like beauty, is in the eye of the beholder. We all see something different but we all see something interesting. In fact architecture ought to be seen as an art form, the artistic output of the architect. 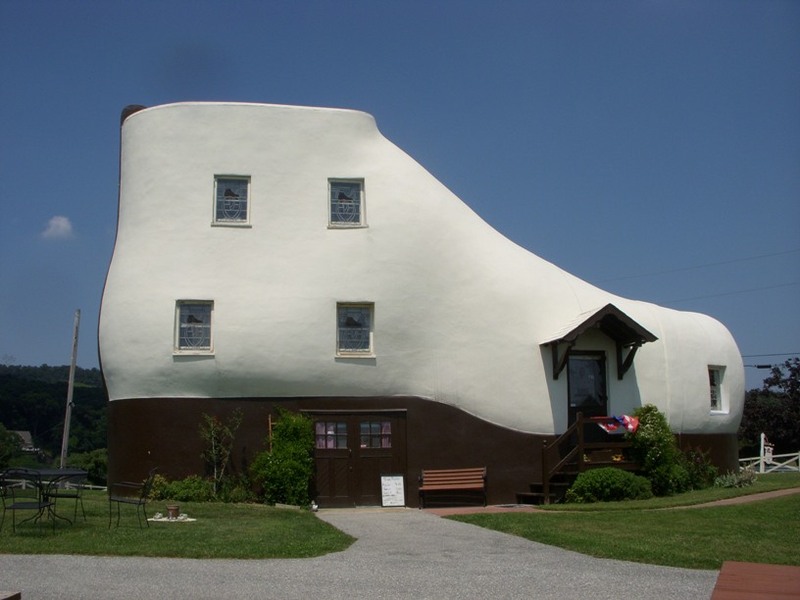 This blog aims to chronicle many of the wonders of the world of architecture. ... perhaps the most long lived reminder of Haines. A stucco covered wood frame building it is some 49 feet long and 25 feet high containing three beds, two baths, a kitchen and a living room across five levels. The building was originally used as a guest house. 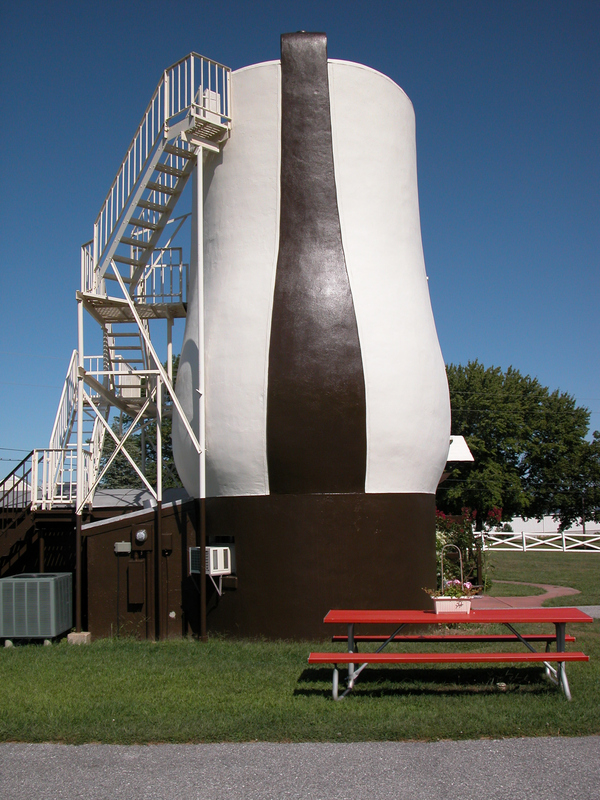 On his death Haines left the property to his employees who sold it in 1964 to Eleanor Hallman who ran it as an ice cream parlor for over 20 years. After passing through the hands of a couple of other owners the house was purchased in 2003 by the Farabaughs who have done significant restoration work and now offer guided tours of the unusual property. The house is open to visitors Wednesday through Sunday from 11:00 to 5:00 June, July and August and on weekends or by appointment in Spring and Fall. 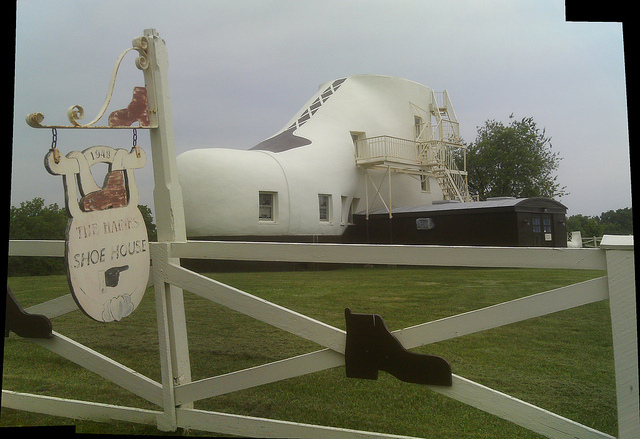 The "Shoe House" has appeared in many publications and was the site of a clue search in the second leg of the eighth season of the TV show The Amazing Race. wonderful building it looks very beautiful.This building may be effective and charming.This stucco construction is great.Thanks for sharing. A British expat now residing in Dallas, Texas. I met my wife on the internet in the days when there was not much of an internet. Turned out well; I have a wonderful wife and we have been happily married since 1997. For all who said that was strange at the time [and maybe even feel it is an odd way to meet even now] I would simply say "Hey, after all those years we are still happy and still each other’s best friend". After working in pubs back in the old country I ended up in restaurant management once I arrived in the US. A few years ago I moved to the corporate office as a member of the training department and a year or so later transferred to the IT department. Age creeps along and we all turn into something we would likely have yelled "no way" at in our youth. Pottering about in the yard is about as active as I get for the most part now. I do enjoy travel and especially enjoy cruising though I am not rich enough to indulge to the extent that I would like. I tend to be somewhat opinionated and many would say a little cynical at times and I have a tendency to share both my opinions and my experience and knowledge whether asked for or otherwise. Get our Google Earth tour .kmz file here. Don't have Google Earth? Get it here. CAN'T GET ENOUGH 'LIMEY? - HE'S ALSO ..
Why is this here? Is it just a big ego trip? Well what do you think? Look at the numbers LOL. Its just helps me track how the site is developing and figure out how to improve the content and style. If you are currently looking to book air flights, a hotel, purchase something online, grab some web hosting or pretty much anything else we have partnered with some of the best known names out there and brought them all together for you here. Anything you might need that is purchased through the links below will cost exactly the same as it would going directly to the site but if you do so from here you would also be helping us grow and maintain this site. What Do I Know - covers many subjects including architecture. The link points to the architecture content but if you have time check out the other stuff too. Writers Blogging Block - offers tips and resources on improving your writing skills, guest authors and a backlinking opportunity. © The Grumpy Old Limey 2011. Theme images by Lingbeek. Powered by Blogger.